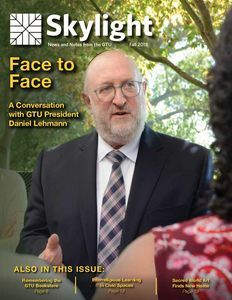 In the Fall 2018 issue of Skylight, we sit down for a conversation with President Daniel Lehmann, as he offers his thoughts on interreligious education, diversity within community, and the mix of scholarship and religious commitment that makes the GTU unique. You'll meet a group of GTU students and alumni working together to share the GTU's approach to interreligious education at a local community college. In addition, we'll share fond memories from the 35-year-history of the GTU Bookstore; talk with our 2018 Excellence in Teaching Award-winner, Dr. Jean-François Racine; learn about new publications from the Center for Dharma Studies; catch up with news from our alumni; and much more! Founded in 2015, The Mira and Ajay Shingal Center for Dharma Studies helps scholars and students from the Hindu and Jain Dharmic heritage communities and other traditions understand Dharma in its multidimensional richness, and encourages cross-cultural and interreligious understanding. Part of student success depends on good health and well being. Here are a few avenues for finding resources to help along the way. Each year, the GTU sponsors a number of public lectures given by noted scholars or artists from within the GTU consortium and elsewhere. Themes range from religious pluralism, theology and natural science, and the meaning of vocation, to Indian dance and Native American oratory.